Never sacrifice style for comfort again! You can be chic and unique, dazzling and daring, bold a beautiful. Riding a bike. Working in the garden. Playing with grandkids. Taking a walk. Going to work. Compression garments are designed to improve your quality of life. They are high-quality products that offer you the freedom to maintain a more active lifestyle and doing the things you really enjoy, like traveling, being outdoors, or participating in your favourite hobbies. With the benefits of therapeutic compression, you can continue to work, play and live more comfortably and in better health. Compression garments are often a part of a management plan to restore or improve circulation and are designed to provide support to the legs and veins and minimize swelling. Usually, major compression stockings brands add new print designs and colors for spring/summer and fall/winter to add to regular patterns and palettes. Because seasons change – so do you! For 2019-2020, there are exciting new print designs and trendy colors to add to regular patterns and palettes. For instance, Juzo brought in new colors with cute and yummy names such as Cupcake and Fairy Dust. 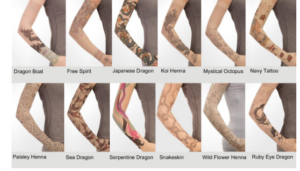 Their compression arm sleeve’s prints are unique, colourful and sassy, with fun patterns such as Japanese Dragon, Wild Flower Henna, Navy Tattoo, etc. 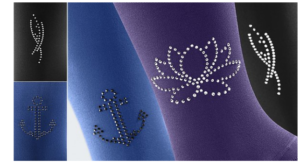 Mediven decided to add a summery motif to their sparkly Swarovski bling such as: Anchor, Waterlily and Wave among 2 new trendy colors – Royal Blue and Violet. Those one-of-a-kind stockings will definitely show your personality, and with so many options, you can maintain your health and comfort and be in step with fashion!